examples of used examples of the 1d (1/-) off cover and a complete list of recorded examples of stamps with a complete date stamp. 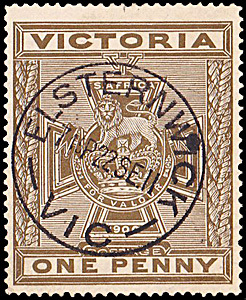 The 1d (1/-) olive-brown stamp features the Victoria Cross. The design is based on one of the competition entries for the 2d denomination. 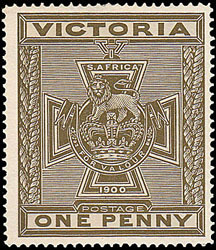 It is the only stamp which has featured the Victoria Cross in this detailed way. Some Australian issues have shown winners of the Victoria Cross. The postal denomination of 1d covered the basic letter rate. Unknown but more than 40,026 (953 sheets) plus some sheets which were sent to the Victorian Agent General in London for sale. Multiples of the 1900 Patriotic Fund stamps are very rare. None have come up at auction since before 2000. There are some blocks of four of the 1d (1/-) but their number is unknown. One block from the lower right corner of a sheet (Provenance: Stone collection) was sold at the Rodney Perry Sale in July 1989 Lot 675. Another block of four was sold by Rod at his sale in April 1998 Lot 1036. As no photos were included in the catalogue, perhaps these were the same item. Several pairs are known to exist with three covers bearing pairs. As listed elsewhere, used 1d (1/-) stamps in good condition with a clear date stamp are scarce. There are at least 11 but probably less than 20 examples recorded. (Late cancellation beyond postal validity). 13 September 1900 Rialto. Duplex. Matthew Bennett April 2003 Lot 2832.